February 1 is the theatrical release date for Arctic, a true-north thriller starring ice-eyed Dane Mads Mikkelsen and both directed and co-written by Joe Penna. 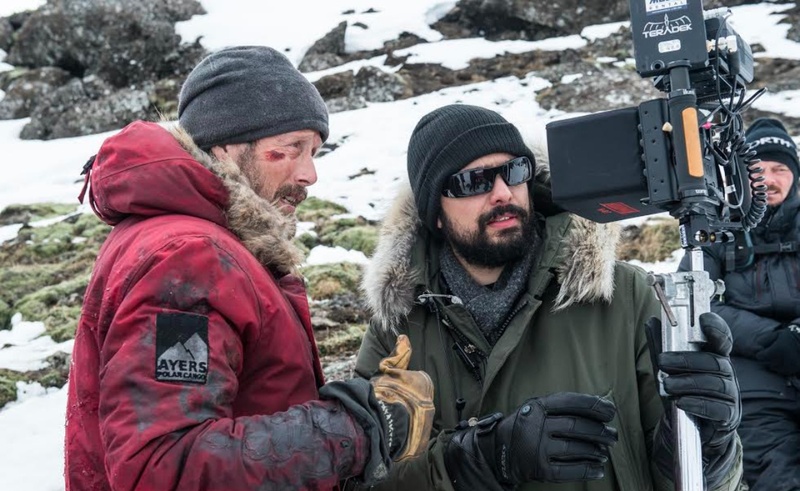 Arctic is Penna’s first feature, and it’s arrival in theaters is the latest step in a multi-year journey that saw the film premiere at the Cannes Film Festival last year. Penna, however, has unusual work experience for a first-time filmmaker. For more than a decade, the 34-year-old Brazilian plied his trade online and predominantly on YouTube as the MysteryGuitarMan, wowing viewers with clips that blended razor-sharp editing with skillful musicianship. Thanks to these exquisitely-crafted videos, Penna racked up 376 million views on the MysteryGuitarMan channel and pulled in more than 2.7 million subscribers since its inception in June 2006. Aided by a signature look that included spiky hair and dark sunglasses, he quickly established himself as one of the early YouTube community’s most recognizable stars. Arctic, then, is no ordinary directorial debut. It’s also the rare film that gives a creator who established himself on YouTube the opportunity to show off his skills on the arthouse circuit. Its domestic distributor, Bleecker Street, has over the past couple of years distributed indie darlings like Paterson, Captain Fantastic, and Disobedience. If the early buzz Arctic has received is any indication, it is another strong entry in Bleecker Street’s catalogue. The film, which follows Mikkelsen as he attempts to survive while marooned in the frigid north, boasts an 81% fresh rating on Rotten Tomatoes at the time of this post. It has also prompted at least one observer to tab it as a potential Oscar contender for 2020 — a bit of praise that did not slip past Penna. How did Penna transition from one of YouTube’s most beloved creators to one of the film industry’s most eye-catching upstarts? And what does he think about the long, strange journey that has taken him from Sao Paulo to the American cineplex? These were questions on my mind as I chatted with him over the phone earlier this week. Tubefilter: How did this come to be? Joe Penna: I was doing YouTube videos and out of that I started doing commercials and music videos and eventually I started making short films. I even did one that was 40 minutes long. So I knew that I wanted to try a feature film. The kinds of features that were being sent to me weren’t the kinds of features that I wanted to do. They were very teen-centric, many of them already had talent attached, some of them were also a continuation of what I had been doing on the YouTube channel. So it was too similar to what I had been doing. Also I think that YouTube is a completely different medium than a feature film. In my videos, I’m trying to maintain interest for two to five minutes. Whereas for a feature film, you have to tell a story over an hour and a half. So I decided to write my own because I understood that as a zero-time director, I wasn’t being sent the best material. So my writing partner [Ryan Morrison] and I wrote our own feature and it was called Stowaway, but still that was too expensive of a feature film for free to be my first feature. So then we decided to write something a little simpler. I found a picture on Reddit that was showing what Mars could look like in the future once we started planting grasses and trees and terraforming the place for it to be habitable for human beings, but still that looked like such an inhospitable place to live. So we wrote an entire feature film where it’s basically the same exact story as Arctic. This guy has crash-landed far away from a Martian colony. We sent it to our agents and they said, well, this is wonderful, but you should really check out the trailer for this new movie called The Martian. It’s kinda stepping on your toes a little bit. We saw the trailer and we saw that it was way too close to what we were trying to do. So we took the same screenplay and changed all of the events to happen in the Arctic, and then we moved on from there. Tubefilter: And how did Mads Mikkelsen get involved? Penna: We put a list together of five or six actors who we thought had the chops to do this — it’s a very difficult film for an actor, with the lack of dialogue and how much they have to say with just their face. And because of our budget we needed somebody who was a relative star but still did indie films every once in a while. Mads was at the very top of the list and our producer knew somebody who knew him. Mads and I talked on Skype for about two or three hours and it was a go from there. Tubefilter: So let’s go back and talk about YouTube a little more. When you started your youtube channel, did you see it as a jumping off point to eventually do something in the TV/commercial/music video/movie landscape? Can you draw a line through your career or are these two separate creative outlets for you? Penna: I was going to school to be a doctor, you know, I was going to be a cardiothoracic surgeon. And when I got started with my YouTube channel, it was just a fun little side hobby. It was just for fun. I got a few thousand subscribers which was weird to me because I didn’t know a few thousand people. So where were these people from? Where were they commenting from? How are they finding my videos? I didn’t understand that. And in the process of beginning to understand it, that’s when I began to think that maybe this is something I want to do. It became my job. Eventually I started getting ad revenue, and then it became something that I was able to do full time and then I could hire other people to help and create a bit of a studio. But there was a change to how youtube promoted their content called Cosmic Panda. I think it’s funny that they asked me to be the person who announced that at VidCon, because unbeknownst to me it was going to eventually spell out the waning of my YouTube channel. Basically overnight I lost the 50 to 60 percent of the viewership on my channel because of the way they changed the front page. And eventually YouTube would start to promote content that drives watch time instead of number of views. And it’s very difficult for my kind of content, which takes a lot of efforts to create just a few minutes worth of stuff, to compete with people who are doing video game walkthroughs. Tubefilter: Your videos are similar to the animation channels, I think, and you hear that from animation channels all the time, that they can’t compete. Penna: It made it not feasible. We all had to scatter. DeStorm started his own company with King Bach and some other very smart people. They needed to figure out how to prolong their content. If you take an overall snapshot of YouTube, it seems like that’s what happened. Tubefilter: So you never went to film school or anything, correct? Penna: No. My film school was basically on YouTube. Tubefilter: My question is, when you went to Cannes, I’m assuming you met the great auteurs of world cinema, you know, these very academic filmmakers. Do you have any sort of disconnect coming from such a different background from what we’d think of as the typical Cannes director? Penna: I wasn’t sure it was going to fit in, but Cannes is very director-centric. They really liked my film. There was a lot of praise that was coming my way. We had a theater of 2,500 people give us a 10-minute standing ovation. You can’t ask for more than that. Tubefilter: That’s cool. Especially since you always hear these stories of people at Cannes booing. Penna: I saw some videos of that on YouTube. It was a bad idea to look those up beforehand. Tubefilter: To take the route you’ve taken, I feel like that’s a very rare path that we haven’t seen that often from YouTube content creators. Penna: It seems like there’s always some in-between steps that people have to take in order to do that. So, you know, for me it was making music videos and commercials. For Bo Burnham, who just did Eighth Grade, it was a stand up comedy. It seems like there, there haven’t been many people who’ve been able to connect from A to B. Maybe Rooster Teeth. For my film, for example, they didn’t even know I had a YouTube channel until we were in pre-production. I was already in Iceland. They were like, what’s the sort of thing that you do? This Magic Guitar Dude? Tubefilter: Everyone knows Magic Guitar Dude. Penna: Popular Twitter channel, right? Tubefilter: It seems like there are all these opportunities on all these platforms to get deals for serial shows. It seems like TV is becoming this huge monster, right? If curious if you agree with that and what drew you specifically to film as opposed to saying, OK, I’m ready for a bigger project, I want to try to make a TV show. Penna: I just announced a first-look deal with a company called Topic who we’re very excited to be working with. It included us going out and shooting a little anthological series, you know, six episodes around 12 minutes each, which is an odd format. But I think that with companies like Facebook Watch and iTunes, and Netflix, that the content is changing. Sometimes you can have a 97 minute feature film like I did and then sometimes you can do six episodes. You know, not short-form, not long-form, kind of in-between. I would love to consider doing a more conventional series. Absolutely. It isn’t something I haven’t done yet because I haven’t written it. Right now we’re focused on the second feature film, which already has some cast attached. Tubefilter: Which is the one you wrote first? Penna: Yes. Stowaway. Um, you know, we’ve attached Anna Kendrick as the lead. Toni Collette plays the commander of the ship. Tubefilter: Toni Colette is amazing. Penna: She’s a wonderful, wonderful actress. Tubefilter: You said there’s a huge difference between making videos on YouTube and making a movie, but did you find that there were certain stylistic elements of your MysteryGuitarMan work that translated when you were directing a feature? Penna: Yeah, definitely. There were a lot of MysteryGuitarMan techniques that we brought to the commercials. And then I had to grow a little bit more outside of what I had done on YouTube to make those commercials great. Because it’s a different medium, right? Thirty seconds is a little different. And then I was able to take what I learned with those commercials to make great music videos. And then for those music videos I had to grow a little bit more. Some of them had a little narrative content before the music video started or in the middle. I was able to take what I had learned making those little narrative bits and then make short films. So there’s been steps where the previous medium informs the next one, but they are different media. Tubefilter: So you took this nontraditional path to being a feature film director. Do you think that’s something more young filmmakers should be taking advantage of, using platforms like YouTube as a starting point? Or do you think that at this point, YouTube has changed so much that it wouldn’t really be a smart decision. Penna: It’s difficult for me to recommend taking the same path I did. To survive within YouTube, you have to play by the rules, you know what I mean? There were a few hundred thousand dollars that I tried to reinvest back onto the YouTube channel, um, that were thankfully just in the coffers from the commercials and music video work, and it didn’t work. So, I can’t tell people that by doing this it’s going to work, especially because I’ve seen so many friends of mine who grew up with me on YouTube and who have very popular channels and they are trying to move to the next step. They haven’t been able to make that happen. I’m very, very glad that I was there when YouTube was just beginning, and I’m so, so incredibly grateful that I’ve been able to learn so much from the platform. YouTube has been a great way for me to develop myself as a filmmaker. I definitely could not have done Arctic if I hadn’t honed my skills for 12 years. I had to do videos twice a week, so I had to learn to move quickly. I had to learn to do everything myself. Eventually I started training other people to help me, but then I had to learn how to communicate with them and how to start to let go and not do everything exactly how I want it, but to bring in people who are smarter than me at certain aspects of filmmaking. And that’s how I got started. So absolutely. I’m very grateful for how I came up on YouTube. I just can’t recommend it because I don’t know what the platform is doing now. Arctic begins its limited theatrical run on February 1st. At first, it will screen in New York and Los Angeles, and it will come to more cities over the following weekends. For up-to-date details about the film and its distribution, head over to its official website.